26ah Solar Photovoltaic (PV) Deep Cycle Battery. Compact footprint T12 type terminals (Brass coated with tin; threaded insert 5mm stud). Ideal for use with 60w and 80w solar panels (in conjunction with a 10 Amp Charge Controller). 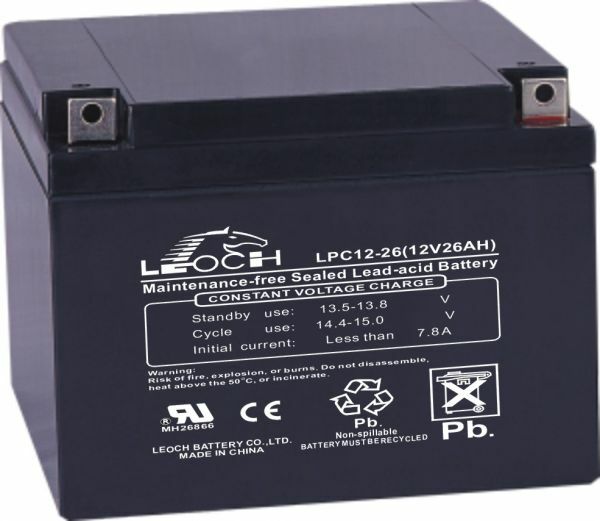 Deep Cyclic Sealed Lead Acid Battery, specifically suited to solar energy storage. This 26ah Solar Battery features AGM technology (Absorbed Glass Matt) which is capable of being repeatedly charged and discharged - ideal for all solar applications. • 80w Solar Panel: 5 Hours.